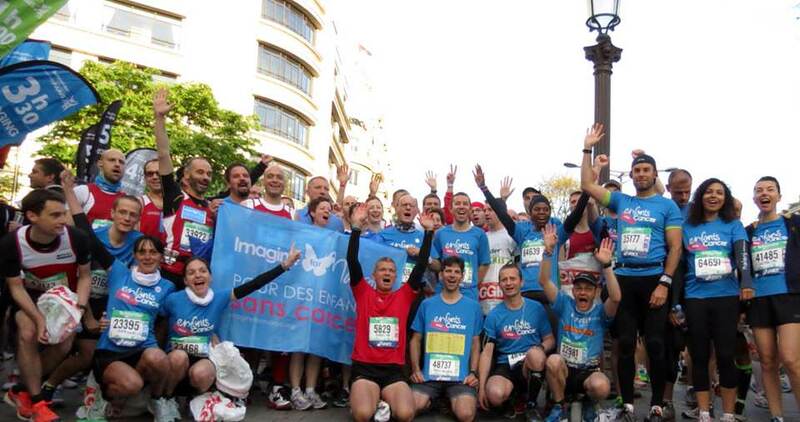 Great day of mobilisation and solidarity for the Paris Marathon, where 50 runners under the colours of Imagine for Margo have jumped to the Paris roads. A total of 38,000 euros have been collected to help speed up the research against paediatric cancers. A beautiful party to the tune of the drums of the band “Les Sons Mêlés”, who have encouraged the runners (for over 4 hours non-stop, bravo and thanks! ), and with our all-volunteer pom-pom girls unleashed, and our beautiful mascot! 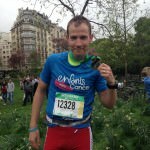 A special BRAVO goes to Sébastien, who finished the marathon. Twenty years after having fought with cancer, he has succeeded at this challenge, giving formidable hopes to the children and families who are fighting now. A particular THANK YOU to the Union Athlétique of the Société Générale, and to its many runners giving us their support, in the Paris Marathon and several other races. And above all, THANK YOU to all the volunteers who took turns at the Running Expo and on the course, because it was a real marathon for them too! A huge THANK YOU and BRAVO to our runners and our collectors for their engagement at our side! Here is the album of this superb day, full of energy, good humour and solidarity. https://plus.google.com/photos/108718612274512505798/albums/5999257815838083857?authkey=CJ7mgaiQlZbHUw BRAVO and THANK YOU for your mobilisation and solidarity. GO, FIGHT, WIN!